The word “Furcia” in the Ladin language means pitchfork! Usually, riding uphill should take you to heaven but, in this case, to get there you’ll need to go through hell! 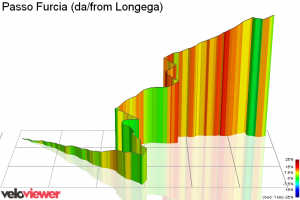 So, you may really see the devil with a pitchfork on the steepest part of the climb! Passo Furcia starts from the town of Al Plan de Mareo (Ladin) but to get there, the climb actually starts from the bottom of the Badia Valley in Longega. From there to Al Plan / San Vigilio there are 4 km – the first 2.5 are easy…but then you get hit with a nice “gimme ten%” that makes you push out of the saddle. Once you pass San Vigilio the climb is easy again until you get to the little hamlet of Curt (Ladin) – or Corte, in Italian. At first you think the road starts to go downhill, but as soon you approach the junction you’ll see the sign to Passo Furcia (or a devil with a pitchfork!) that shows you the way. 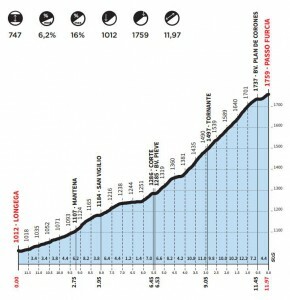 From here you still have 5.4 km to ride with an elevation gain of 454 meters and an 8.4 % average grade. Luckily, if you started from Longega, you’ve already warmed up or you’d really be hurting by now. But it’s not that hard – at least not the first 1.5 km! 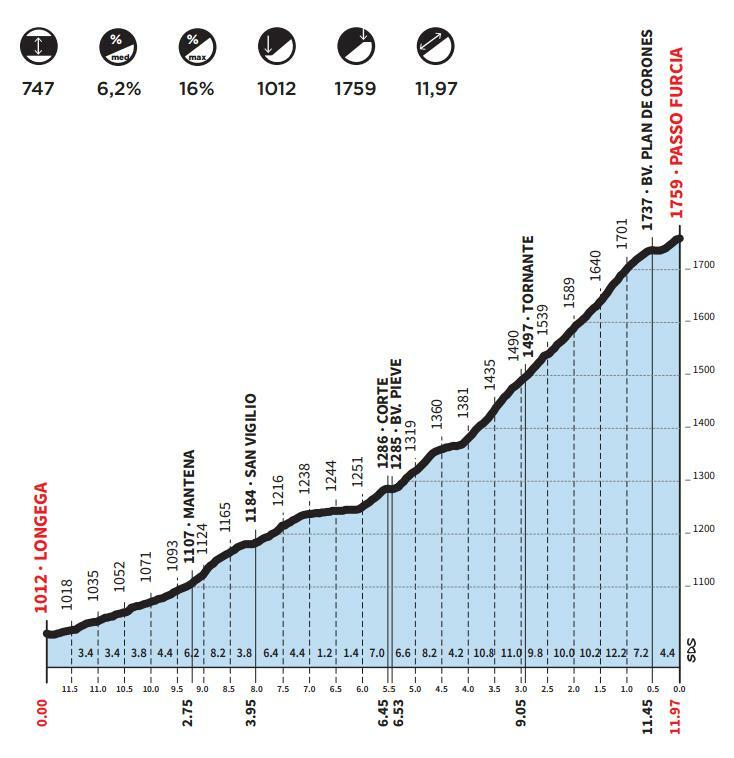 That’s when the only 4 hairpins of the Passo Furcia begin with a gradient that is always above 10% and even hits 15%! If it’s a warm day you’ll be sweating like hell on this stretch because the sun shines on this side of the hill (see picture). The hairpin stretch is only 1.5 km long and, once it ends, the gradient continues above 10% with just a few breathers. Things get interesting again at 2 km from the top where you’ll be out of your saddle, pushing hard on your pedals in order to leave this +15% to 17% slope grade as soon as possible! As soon you come out of the straight section the road turns right and you pass through a short tunnel – this part is flat and you can build up some speed for the last 200 meter-climb to the top of Passo Furcia. From Passo Furcia the road continues to Plan de Corones / Kronplatz where the Giro d’Italia finished twice with a Time Trial starting from San Vigilio di Marebbe. Many thanks for a great route looping round the Passo Furcia. The lanes you took me on the lower segments were lovely and avoided the main roads. The pass itself is tough! happy that the route was useful to you. 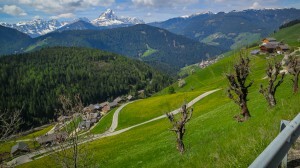 Looking forward to have you again cycling through the Dolomites. 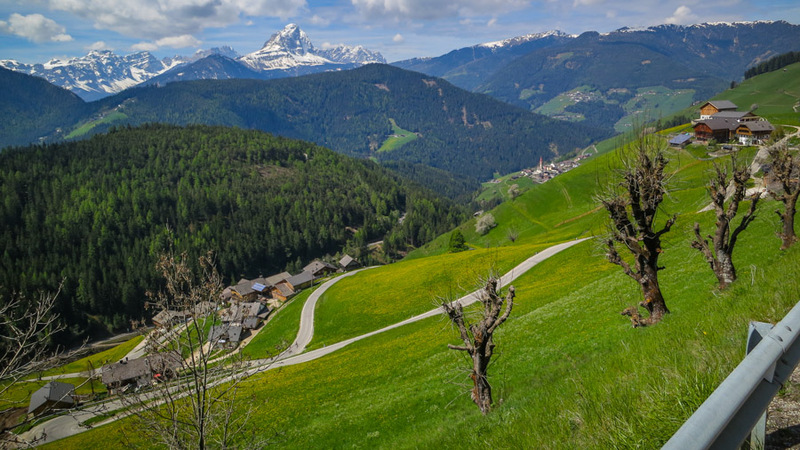 From the town of Marebbe there is a nice ride into Fanes park – an out and back through a spectacular valley with almost no traffic. It’s a gentle climb for about 16 km, then a nice coast down. It makes for a nice warm up ride before you tackle the pass. Leave a Reply to Dermot O'Riordan Click here to cancel reply.